Viewed from the 48th floor sundeck of Washington Mutual Tower with the Columbia Center behind it. Safeco Plaza, previously 1001 Fourth Avenue Plaza and the Seattle-First National Bank Building, is a 50-story, 630-foot (190 m) skyscraper in the northwest United States, located in downtown Seattle, Washington. The building is sometimes referred to by locals as "The Box the Space Needle Came In." The tower was completed in 1969 by the Howard S. Wright Construction Company for Seattle First National Bank. It dwarfed Smith Tower, which had reigned as downtown's tallest building since 1914, and edged out the Space Needle (built in 1962) in Seattle Center by 25 ft (7.6 m) to become the tallest structure in the city for sixteen years, until the completion of the Columbia Center in 1985. The bronze-colored aluminum and glass structure was the first modern class-A office building in Seattle and is the first skyscraper in the world to feature a Vierendeel space frame. The structure includes a two-story lobby as well as a five-story subterranean garage. Other amenities include 15,000 square feet (1,400 m2) of ground-floor retail featuring a fitness center, a bank, some restaurants, a medical center, and a post office. The property also houses a sculpture titled Three Piece Sculpture: Vertebrae 1968 by Henry Moore which is owned by the Seattle Art Museum. The "Seattle First National Bank Building" in 1969. Originally the headquarters of Seafirst Bank, it was sold fourteen years later in 1983. Safeco Insurance Company of America leased 284,000 square feet (26,400 m2) of the building on May 23, 2006, to be its headquarters, moving from its former building in the University District and Redmond, and renamed it Safeco Plaza. The company announced in 2015 that it would consolidate its offices into the tower, increasing its lease from 17 to 26 floors. On July 6, 2016, it was reported that German firm GLL Real Estate Partners GmbH agreed to buy the building for $387 million. The tower had previously been sold in 2005 to CalPERS and Hines for $163 million; the sale in 1983 was for $123 million. ^ "Safeco Plaza". CTBUH Skyscraper Center. ^ a b c "Seafirst sells its skyscraper". Spokane Chronicle. Associated Press. September 30, 1983. p. 18. ^ Stein, Alan J. (May 31, 1999). "Seattle First National Bank building is dedicated on March 28, 1969". HistoryLink. Retrieved August 1, 2010. ^ a b Dorpat, Paul (February 3, 2006). "Boxed In". The Seattle Times. Retrieved August 1, 2010. ^ a b c "Safeco Plaza". hines.com. Retrieved April 12, 2017. ^ "Seattle Municipal Archives Photograph Collection". clerk.ci.seattle.wa.us. Retrieved 2018-09-29. ^ Allison, Melissa (May 25, 2006). "Safeco says headquarters to be in downtown tower". The Seattle Times. Retrieved July 6, 2016. ^ "Safeco Corporation Form 8-K". United States Securities and Exchange Commission. May 23, 2006. Retrieved July 6, 2016. ^ "Safeco Announces New Headquarters and Regional Office in Downtown Seattle" (Press release). Safeco Corporation. May 24, 2006. Retrieved July 6, 2016 – via PR Newswire. ^ Stiles, Marc (November 3, 2015). "Exclusive: In huge blow to Seattle office developers, Safeco will consolidate in current HQ". Puget Sound Business Journal. Retrieved July 6, 2016. ^ Stiles, Marc (July 6, 2016). "Real estate deal of the year: 50-story Seattle tower sells for $387M". Puget Sound Business Journal. Retrieved July 6, 2016. ^ "Report: Safeco Plaza could sell for $387 million". The Seattle Times. July 7, 2016. Retrieved July 7, 2016. ^ "Hines, CalPers buy 1001 Fourth Plaza". Puget Sound Business Journal. May 3, 2005. Retrieved July 7, 2016. 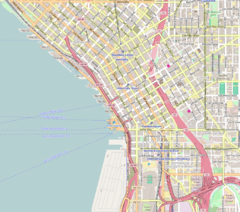 Wikimedia Commons has media related to Safeco Plaza (Seattle, Washington).